People who try to carry firearms into the Republican National Convention (RNC) will not be allowed to pass through a checkpoint even if they have a ticket, a Secret Service official said Monday. The Secret Service has the authority to prevent firearms from entering sites that are visited by their protectees, including presidential candidates, spokesman Rob Hoback said in a statement Monday in response to an online petition that calls for the allowance of guns at the RNC in July. "Individuals determined to be carrying firearms will not be allowed past a predetermined outer perimeter checkpoint, regardless of whether they possess a ticket to the event," Hoback said. Only authorized law enforcement who coordinate with the Secret Service for an event, he said, are allowed to carry a firearm inside of a protected site. The petition, which has garnered more than 43,000 signatures and features what appears to be a photo of a semi-automatic rifle, on Change.org calls for the allowance of guns at Cleveland's Quicken Loans Arena at the convention in July. It's possible the petition may be a satire; the person who spear-headed it has a Twitter account whose feed mocks Republican presidential candidates and follows Democrats or Democratic organizations. While Ohio has an open-carry law, the arena prohibits people from carrying firearms inside. "We must take a stand," the petition says. "We cannot allow the national nominating convention of the party of Lincoln and Reagan to be hijacked by weakness and political correctness. The policies of the Quicken Loans Arena do not supersede the rights given to us by our Creator in the U.S. Constitution." 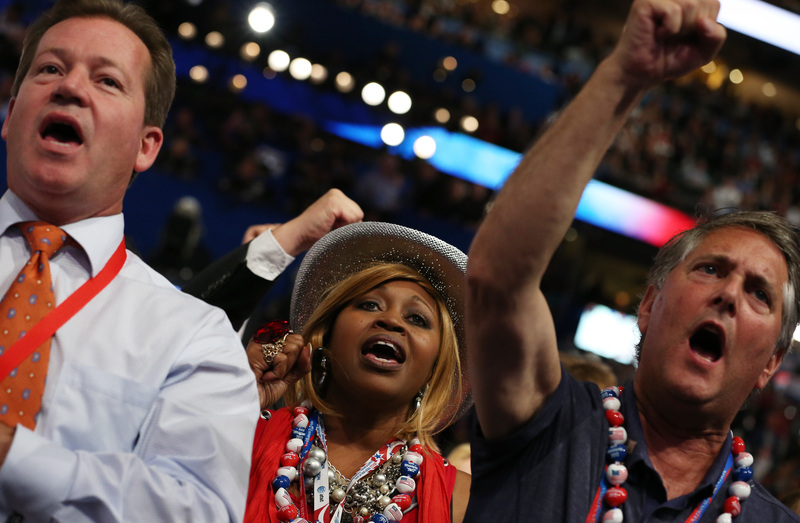 The petition calls on Quicken Loans Arena to suspend its policy on guns for the RNC from July 18 to 21 and for Ohio Gov. John Kasich, one of the presidential candidates, to use his executive authority to override the "gun-free zone loophole" at the venue. It also demands that the Republican National Committee and its chairman Reince Priebus prepare a contingency plan for an alternate location for the convention. On Sunday, Donald Trump weighed in on the proposal and said he would take a closer look at it. "I have not seen the petition," he said on ABC's "This Week." "I want to see what it says. I want to read the fine print." Security is expected to be tight at the convention. At the 2012 RNC in Tampa, Florida, people had to enter through multiple security checkpoints and metal detectors to enter the convention space and they weren't allowed to bring in firearms. CBS News' Arden Farhi and Emily Schultheis contributed to this report.